So - since I didn't quite find the answer I was looking for, despite doing a search - I thought I'd ask! While I know it's arguably best to keep instruments in their case while not in use, I'd rather have easier (and more attractive) access to mine. I'd like to have both guitars and/or a mandolin out if possible. The black metal guitar stands just don't look very nice. I have a single Hercules stand already. I don't have room for a rack - plus, they also don't look very nice. The wall is out. 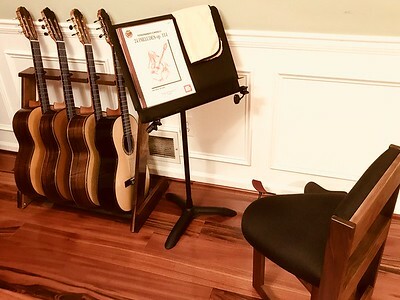 I have a music room that is safe - just needs to be sturdy enough to thwart cats. I can't even find a DIY example on-line that I like. Fender does make a nice-looking single or double wooden stand that is almost what I think I'd like, but not quite either. Just wondering what others do or if there's an option I haven't come across yet. I leave my guitar on a chaise lounge that I do not use. I find that placement safer and nicer than a stand hanging around. Mike: Yes! That is a lovely stand! Wish they'd make a double! bellemeade: Don't think I can squeeze a chaise lounge into my room. There's already an armchair in there I don't sit in anymore because it's been commandeered by cats. If I put a chaise lounge in - it would really go to their heads! Try to find a woodworker/cabinet maker and design your own. Some of the Trade/Vocational High Schools might be worth a shot and they might only charge for materials. Years ago I had one of the Vocational Schools fabricate some steel braces and they were glad to have the work. On another occasion, I wanted to put in a water wheel to generate electricity. I contacted the engineering department of a local college and they did a feasibility study for free. Been wanting to build my own humidity controlled wooden cabinet with glass door to store/display the guitar. It would make it much easier/faster to store and take out the guitar, and it would be much easier to maintain/monitor humidity. There are products like this on the market already like the acoustic remedy case, but overpriced for me. South Mountain Woodworks has some very attractive stands. I've thought about upgrading my metal stand too but just have to admit that I'm too clumsy for that luxury. My guitars are far safer in the case between practice sessions..
Search for "Urlacher guitar stands". Collaboration with Sterner who designed the stand originally. The only good-looking guitar stand I have ever seen. But pricy. I found the one pictured after a ton of searching for something like it. It actually came up on Etsy, which I had never used before, and is made by a guy named ME Ross DBA AllwoodStands. It's very well made and was reasonably priced. He makes them in all kinds of configurations based on your needs. Took about 6 weeks to get it though because he builds them all from scratch. I have something similar to this, made from metal with foam covered pegs to separate the guitars. I removed the pegs and left the guitars in cases. I can keep 5 of them there. Thanks for ideas and input everyone! Ordering anything from the US at the moment is too expensive - but I can see if there's someone local who has an interest in making something for me! Someone mentioned Acoustic Remedy ... I think I may be headed that way. But, FYI - Acoustic Remedy does make an interesting Double Guitar stand.